The Coordinate widget displays x- and y-coordinate values on the map. With the default coordinate system of the web map, the coordinate values change dynamically when the mouse pointer moves to locations on the map. Multiple spatial references can be configured and the coordinate values display based on the spatial reference you choose when the application starts. 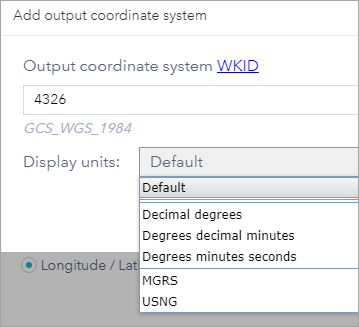 By default, the Coordinate widget displays coordinates in the WGS_1984_Web_Mercator_Auxiliary_Sphere (WKID 3857) projection. To display coordinates in other projections or datums, add spatial references during the configuration. Hover over the Coordinate widget and click the Show or hide widget button to show or hide the widget in your app. Click Add output coordinate system. Provide a valid well-known ID (WKID) in the Output coordinate system WKID text box, choose the display units, and provide a valid WKID in the Datum Transformation WKID text box if the datum of the output coordinate system is different than the default. When a valid datum transformation WKID is specified, the Use Transformation Forward option displays. It indicates whether to transform forward. The forward or reverse direction of transformation is implied in the name of the transformation. See Datum transformations for more information. The spatial reference defined above is added to the list. Repeat the above steps to add other spatial references if necessary. Optionally click the edit button under Actions to edit the coordinate system. Optionally make your coordinate choice the default. Optionally double-click the label of the coordinate system to rename it. Choose the decimal places to round the coordinates. Uncheck the box if you don't want to show the thousand separators. Select the display order of the coordinates. When the app starts, it displays the coordinate system at the top of the Output Coordinate System Name list. For the default coordinate system of the web map, the coordinates will change accordingly when you move the mouse pointer on the map. For mobile devices, the widget only displays the coordinates of the center of the map. Click the Enable clicking the map to get coordinates button to enable clicking the map to get coordinates. You can add a point to the map, highlight the coordinates, and make a copy of the coordinates. Click the arrow on the widget to display a list of spatial references specified in the configuration. When you choose one from the list, it becomes active. For most spatial references, except WKID 3857 and 4326, you must click the Enable clicking the map to get coordinates button again to display the coordinates by adding a point to the map. You can also highlight the coordinates and make a copy of them.